If this sounds familiar, it’s because a version of this game had been announced in fall 2018 as Angry Birds: First Person Slingshot...for the Magic Leap. There’s even a VR version of Isle of Pigs that launched in February 2019 for the HTC Vive and Oculus Rift. But we did say mobile: you’ll be able to play this new edition of Isle of Pigs on most iOS devices as a free-to-play game. TechRadar got an early look at the title in the weeks leading up to GDC 2019. Rovio Entertainment, the studio behind the Angry Birds franchise, gave a live demonstration of Isle of Pigs, which was developed by Resolution Games (as were the earlier Magic Leap and VR versions). 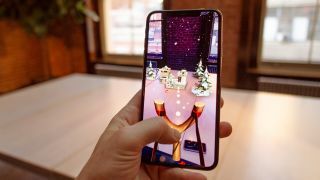 TechRadar saw how it will play on a smartphone...and the answer is, surprisingly well.